We tagged along with the Brownells crew to the Texas Hill Country to visit Ox Ranch and Drivetanks.com and fire a WW2 era M2A1 Howitzer! These towed artillery pieces were the workhorse big guns of WW2 and several later conflicts. Capable of firing a variety of different shells for various mission requirements, they are extremely versatile, reliable and effective guns. Stay tuned, much more on the way. Story of a 105mm artillery crew at Iwo Jima, (G Battery) from the 5th Marine Division and their 105mm howitzer (named Glamour Gal), from the time the unit leaves Camp Pendleton, California. The film follows Glamour Gal and her escorts from the time she ships off through her service on Iwo Jima... the monotony is broken once the captain announces that they are approaching their destination, Iwo Jima, described as "some rock in between the devil and the Dutch East Indies". The rest of the film is devoted to authentic color footage of the battle of Iwo Jima... The film ends on a somber note, informing the audience of the servicemen who will never leave Iwo Jima. This was the second film the U.S. military produced about Iwo Jima, the first being To the Shores of Iwo Jima, which featured the famous flag-raising sequence. The Battle of Iwo Jima (19 February -- 26 March 1945), or Operation Detachment, was a major battle in which the United States fought for and captured the island of Iwo Jima from the Empire of Japan. The U.S. invasion, charged with the mission of capturing the three airfields on Iwo Jima, resulted in some of the fiercest fighting in the Pacific Campaign of World War II. The Imperial Japanese Army positions on the island were heavily fortified, with a vast network of bunkers, hidden artillery, and 18 km (11 mi) of underground tunnels. The Americans were covered by extensive naval and air support, capable of delivering an enormous amount of firepower onto the Japanese positions. The battle was the first American attack on the Japanese Home Islands, and the Imperial soldiers defended their positions tenaciously. Iwo Jima was also the only U.S. Marine battle where the American overall casualties exceeded the Japanese, although Japanese combat deaths numbered 3 times that of Americans. Of the 22,000 Japanese soldiers present at the beginning of the battle, only 216 were taken prisoner. The rest were killed or missing and assumed dead. Despite heavy fighting and casualties on both sides, Japanese defeat was assured from the start. The Americans possessed an overwhelming superiority in arms and numbers; this, coupled with the impossibility of Japanese retreat or reinforcement, ensured that there was no plausible scenario in which the U.S. could have lost the battle. Of the 22,060 Japanese soldiers entrenched on the island, 21,844 died either from fighting or by ritual suicide. Only 216 were captured during the battle. According to the official Navy Department Library website, "The 36-day (Iwo Jima) assault resulted in more than 26,000 American casualties, including 6,800 dead." To put that into context, the 82-day Battle for Okinawa lasted from early April until mid-June 1945 and U.S. (5 Army and 2 Marine Corps Divisions) casualties were over 62,000 of whom over 12,000 were killed or missing ; while the Battle of the Bulge lasted 40 days (16 December 44 -- 25 January 45) with almost 90,000 U.S. casualties; 19,000 killed, 47,500 wounded, and 23,000 captured or missing. The M119 howitzer's recoil system consists of a recoil brake (a damping system) and a hydropneumatic recuperator (a gas spring system). 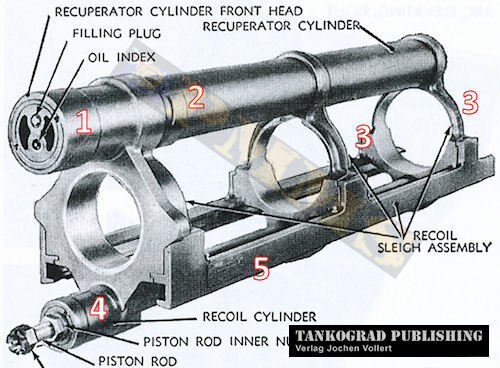 A recoil system's main function is to absorb and control the rearward movement of the cannon and return it to its original firing position, thus avoiding violent shock to, or movement of, the carriage. In this US army artillery firing exercise footage, u.s. army artillery soldiers receiving a fire mission, prepping, loading and firing three very powerful 105mm High Explosive (HE) rounds from the M119A3 Lightweight Howitzer. GoPro footage with slow motion of the above mentioned participating in Exercise Dynamic Frontm2018, Grafenwoehr Training Area (GTA), Grafenwoehr, Germany. *DISCLAIMER* This footage is part of an US army artillery training exercise archive. This footage is not meant to glorify war or violence.We are only sharing this footage for the purposes of news reporting and educating. This is a military archive documentary.